Is it the lines Tannim? I could make them bigger if that helps? Either of these. But I was speaking specifically to the AB expectations, which are at best, inaccurate. Soo... the closer CoT gets to a Releasable version of the AB, the more video examples we will see with PC's made with the AB? I'm afraid I can no longer accurately answer that question. Were it my say, no. But I like to surprise people. Notice how the further image gets blended out? Kills the 3D effect except for the mouse click state. I'm curious what issues people were having with the tool. It still (to me) does not convey movement, particularly movement via teleportation. All I get out of it is vague, "shadowy" trail as if coming out of a hidden state. I think, to get the point across that this is a movement effect, the image needs to convey that. 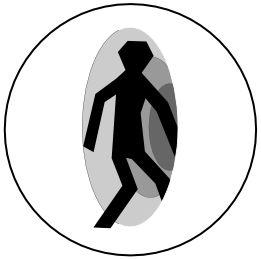 The UI icon itself (the circle, should be colored (probably a light color but not white or grey), the fore-image should be white, and probably be in a more...active pose, the background image should then be black (or grey) and appear in a slightly different pose. All of it is moot however as everything needs to pass through both Art and UI teams and anything else is more academic (or at least it provides some form of early feedback for what works and doesn't for said Art and UI teams to reference). Make the farthest silhouette pure white maybe? So, basically making the unpressed (normal button state) the most important one that stands out, and kinda letting the pressed version look plain (worse), assuming its just a single image for all button states. :( Which is fine, just a tad more restrictive. Please bear in mind none of the UI art assets from this video came from the UI team nor the art department. They are tech provided placeholders of ( to me ) Unknown origin. This is entirely correct, they are tech provided placeholders. The final UI should look better, but we're in a fast-iteration stance and trying to see what fits. We've already learned one huge lesson about, er, bugs. Oh? Well, now I know who to beat. I'm not seeing any of Kiyori's images, either. Just getting the standard little "image not found" icon. I expect it's a problem with the source, since nowhere in that monstrous URL do I see anything like a .jpg or a .gif. Thanks, I can see it and I couldn't before. But I think the lines still make it look a lot like a movement power. If you are having a lot of problems with icons why not just change it to a words, you would have to accommodate for languages (which may be tricky) but I think it may be more understandable in the long run. While waiting for proper art tools, here's what I would say to this with respect to my original suggestion (a page or so back). This has both mannequins being equal size. As a result, there is no sense of implied depth perception/perspective (foreground large, background small) to give the sense of near/big vs far/small. My recommendation is to make the bottom left mannequin larger, perhaps to the point of occupying the entire bottom left quadrant. Furthermore, it is not necessary to view the mannequin in its entirety, so head and shoulders ought to suffice, with the rest of the mannequin being clipped out of frame by the surrounding roundel. The top right mannequin is about the right size, but I'd drop entirely the (*ahem*) crotch glow and the transporter pad circle on the ground with the yellow sparkles. My reason being that although these are fine for a genre specific teleport (ala Star Trek transporter) they are insufficiently art and animation agnostic to cover the myriad animation/FX possibilities available in City of Titans. I'd also want the "far" small mannequin in the top right to be the "solid" one and the "large" big mannequin in the bottom left to be the one transitioning towards transparency (perhaps in a top right corner to bottom left corner blended gradient sort of way). For speed lines, you draw them to correspond to the different mannequin parts, but in such a way as to have them "converging" from the large mannequin bottom left onto the same parts top right. Head to head, shoulder to shoulder, hand to hand, feet to feet. Use solid lines for the outermost speed lines, but then use dashed/dotted lines for all of the "interior" speed lines between those outermost lines. Trust me, once I can do a decent mock up of all of this in a "real" tool like Photoshop, it'll be a LOT CLEARER than it is trying to describe everything through pure text. Picture vs Thousand Words and all that jazz. This is around the time i share the link to Bakuman. Yup, that one comes through loud and clear. Hmmm... Perhaps the lines could be made dashed? Or replaced by an arrow? Okay Foradain you stole my thunder *goes away sulking* I was going to say arrow.....:( it's okay it just means that great minds think alike ! Right. That's why your suggestion of a portal power is a good one. It IS a movement power, but a good one. How we would implement such (assuming that we did) and what necessary restrictions would need to be imposed to avoid overpowering it would need to be thought out. Mission "teleport" springs to mind as a perfect use, and more logical than what CoX did. Our equivalent of base teleport and similar also springs to mind. Ok. That' teaches me to post without previewing. My entire comment is in the wrong place and messed up. It would obviously need some tinkering with but conceptually what do you think of this? That's why we can edit our posts! Honestly? If I didn't know ahead of time you were trying to imply a movement/travel power I'd have no idea what this is intended to represent. By that I mean that what you are displaying does not intuitively explain what you're attempting to convey. To clarify even further, I can't tell if this is a Growth power or a Density Increase power (to pull some Champions/Mutants & Masterminds terminology). Heck, for all I know, looking at this, you're doing a "And I'll Form ... THE HEAD!" combiner power with this one. The composition doesn't imply "movement" or even distance or attempt to invoke perspective in any way. If there's ever an "Ankle Biter" power included in a powerset somewhere (no, I'm NOT going to point out where the arrow is actually aimed! ), this might be worth considering, but for a Teleport power ... let's just say that this iconography does not "speak" to that meaning and interpretation all that well. Silly thought- come up with a way to signify that the icon is "travel power"; like do something with the band of the outer circle or something. Could possibly be latter combined with attack-related inner icons if we come up ramming attacks or something. I wish I could bake you guys a cake. Honestly? If I didn't know ahead of time you were trying to imply a movement/travel power I'd have no idea what this is intended to represent. By that I mean that what you are displaying does not intuitively explain what you're attempting to convey. There can be considerable leeway with this. This isn't some kind of charades, after all. Nobody will see that icon unless they look at the teleport powers. The key is that when someone looks at the icon they will instantly remember that this button is for teleport and not be prone to confuse it with the icon of some other power. HERE is a handy guide to the power icon legend from CoH. I think CoT should adopt a similar format or style. Of course first the devs have to nail down all of the effects that the game will feature (if they haven't already), and then develop a simple and consistent iconography around this. Due to the nature of Aesthetic Decoupling this might necessitate a slightly simpler iconography - for instance, in CoH the Ice Melee power had a standard "multiple melee attack" icon for Frozen Fists, but a sword icon for another melee attack - Ice Sword. This was useful because the animations were fixed to those specific powers. In CoT this may not necessarily be the case. That is true, Fez. But at the same time, you still want the iconography to be as unambiguously and intuitively obvious as possible to achieve "clarity" in the visual language you're presenting. That's a lot more challenging to achieve than a lot of us would like to think. hmmm maybe it is partially a matter of arrangement. Reverse the image and put broken image in the front and the solid in the distance. "here to there" reverse arrow . OR oo oo just use that broken image as it is with that circle underneath, it does look "star trekkie" what ever the icon it will need to be clearly seen when reduced down to button size. Indeed - thankfully this is helped with context. The CoH icon for Teleport doesn't immediately scream "teleportation" to me, but you look at the icon, read that the power is called "Teleport" and it immediately clicks. Someone might think "two guys behind a ladder", but hopefully once it's read that it's a teleport power - it should become apparent. Alternatively, instead of the feathered lines in the teleport effect, a big arrow pointing to the right could better convey motion. Please forgive the ... crudity ... of this particular iteration. However, I think that this image ought to get across what I was trying to "say" ... visually speaking ... with respect to the iconography. Clearly there is plenty of room for all kinds of refinements, but this is the basic "shape" of what I was trying to get at (and failing to explain adequately through pure text, apparently). The intent here is to use a Single Point Perspective with the speed lines between the two figures focusing onto a vanishing point (which in this case is implied rather than explicitly marked). The "far" mannequin on the right side of the image is shown as solid, while the "near" mannequin on the left side is shown in a blended transparency gradient to imply a transitional movement from one place to the other. In this case, I only had a Line Tool to work with and just drew representative, rather than perfect, lines to illustrate the concept of being able to "connect" the movement from one figure to the other. The image is intended to be evocative of a sense of using an offset 3rd person camera position/angle to illustrate the transfer through a depth of space so as to bring to mind "forward" movement, rather than just a 2D side to side shift. So the idea here is an "over the shoulder look" at what happens when the Teleport power gets used. I included the portion of the Mannequin outside the roundel of the Icon perimeter to further clarify the design intent and HOW I was doing what I was doing (and because I couldn't crop the image the way I wanted to using unfamiliar UI tools). In this case, I figured that Show Your Work to explain the thought process behind it was more important than getting a perfectly round cropping of the final image intended to be used. So don't just SHOW, but also MAKE CLEAR what you're trying to explain. ... with the left mannequin in the extreme foreground (as shown) and the right mannequin "closer" to the vanishing point, but not all the way there, within the limits of the circular space available. In the example provided above, I tried to set the vanishing point essentially ON the circumference of the perimeter of the icon's circular boundary. That way, the transition from one mannequin to the other doesn't feel like it's "too far" off boresight along the direction of travel to the Vanishing Point, while at the same time offering enough white space between the two figures to clearly mark that one is "traveling" to the other without "running" through the intervening space due to the "neutral" standing stance of the mannequin. If I had to do this over again, I'd want to pick my Vanishing Point FIRST ... then draw the outermost speed lines radiating outward to the left from it in a (lopsided) cone. Next, I'd want to position the large and small mannequins onto those speed lines in ways that have those speed lines intersecting the same points on the two mannequins (as I tried to show here) in order to "fit" the mannequins into the spots they'd need to occupy within the image at their selected individual scales. Then I'd add extra dashed speed lines aiming at the Vanishing Point as needed for emphasis/clarity. After that, it's just a matter of applying a "fade" gradient to the big/left mannequin, with the "direction" of the fade also oriented at the Vanishing Point as well. I used a "flat" perpendicular fade here (as you can see), but a circular fade pattern would be equally valid and worth trying to see how it looks if your tools will allow that. The last step would simply be an extra layer to "white out" and cover up the unwanted portions of the speed lines so they don't clip through either mannequin. Flatten image and then ship it. I would like to think that this presentation is not only "clean" and clear enough to survive the transition to smaller scale, but also possessing sufficient contrast to not get "lost" into the background should the icon background be given coloring and/or shading. ... when it comes to conveying the notion of Teleporting downRANGE from your starting position. I would recommend the opposite of the angled image. The faded mannequin should be in the back ground (back and to the left) with the more solid mannequin facing closer to the "camera" (front and to the right). While the moving in game is to "teleport away" the ic N would read left-to-right, just like text and since it would natuarally be viewed much smaller on a screen, you want the more prevalent portion of the image in the foreground rather than the background. Heck the old game's icon was much similar in that regard and it didn't even convey any sense of movement but still seemed to suffice in that there wasn't at least any heavy lobbying or deep discussion over requests for improving the icon art. So a slight improvement in that regard should suffice. Keep in mind that there are different teams involved for both art and UI so anything already portrayed in this thread might never be used in any stage outside of our prototype. There's your precedent. 32x32 pixels. I would recommend the opposite of the angled image. The faded mannequin should be in the back ground (back and to the left) with the more solid mannequin facing closer to the "camera" (front and to the right). While the moving in game is to "teleport away" the icon would read left-to-right, just like text and since it would naturally be viewed much smaller on a screen, you want the more prevalent portion of the image in the foreground rather than the background. And this is where what you're saying and what I can only imagine you meaning add up to make no sense. ... "reads" from left to right. The "movement" is from near/left to far/right ... from left to right ... when looking at the icon. The fading to solid transition "reads" as being a "leave here, go there" movement ... from near/left to far/right. 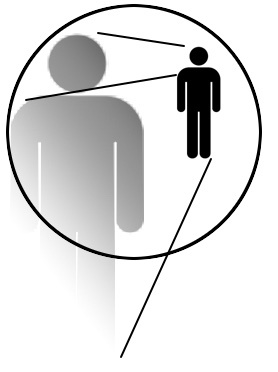 The Point of View being used is meant to be seen as an over the shoulder from behind view, thereby being close to the look of what everyone should be accustomed to seeing in a 3rd Person Camera view of their character performing the action (albeit off-boresight angle so as to not have the mannequins overlapping within the frame of the icon). Just about the only way I can possibly make clearer that you're looking at the BACK of the two respective mannequins, rather than the front, would be to "dress" the mannequins in such a way as to conclusively convey the fact that you're looking at the back of them, rather than the front. Given the pixel budget we've got to work with, given that these icons are going to get shrunk down in size, that's a pretty tall order ... by which I means that just about all the subtle details needed to convey that information will almost certainly be lost when the icon gets crunched down to size. So, at its heart, your complaint against the One-point Perspective view for the iconography is that without ARROWS pointing which way the teleport goes, the iconography is ... reversible. I see it as reading from left to right. You see it as reading from right to left. I interpret the fact that the icon as presented can be reversibly read as a point in its favor, rather than a flaw to be eliminated. After all, not everyone in the world reads their text from left to right. Just saying having this shrunken down with the solid figure in the background won't come off as well with the faded figure taking up most of the space in the foreground. That it would probably be easier for most people to make out that way. I've actually shown this to someone who has had over 20 years experience in commercial graphics design and he concurred. He even provided me with some examples from other games concept art that did something very similar and the sold figure was always in the foreground. Coming up with a 2D icon that implicitly gets understood as movement through (3 dimensional) SPACE ... rather than just movement on a (flat, 2 dimensional) PLANE. There's your problem - you're overthinking it - the icons are supposed to be simple concepts. All that is required is to give the impression of point to point movement - 3d vs 2d and forced perspective is irrelevant. Just look at the original icon for Teleport in CoH. People had no difficulty equating that with teleportation. I think instead that you're all not thinking about it enough, the details are important. It's not easy to make something clear and simple, in fact one of you is making it too complex (which means there is more hand-work than "head" into that) and another is understimating the problem. Please watch again the City of Heroes's icon and think about the differences with your work, and the real issue. 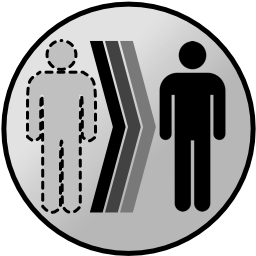 REAL ISSUE = A simple icon about teleportation power could become easily confused for something else, but specifically what? Cloning powers? Superspeed power? Phase power? The ways to resolve this are either a portal-related icon (that has nothing to do with Superspeed or clones, even if that could be mistaken with "moving through walls") or a stance that makes it impossible to think that's a superspeed power. City of Heroes resolved this with a stance (here it is the important detail which makes it all, the arms and legs position in the simple icon) that cannot be mistaken with superspeed at all, it's very obvious that person is "standing" and still changing place. You could only mistake it with a cloning power, but that was resolved too, by making one of the two "standing persons" disappear. One is disappearing, the other is completely colored, both are standing. These are the details that make the mind understand what's happening with a simple icon. If instead you put there an icon that's too generic like the usual watercloset-men-icon, than I could simply think that's an icon where somebody is moving fast but you didn't put "animation" to simplify it. That cannot happen with the City of heroes icon as it's rich of details, the right details, the arms and legs are specifically placed in a way that says "I'm standing" (and not only that, but the "heroic" standing, just to reach perfection I'd say). Okay, substitute the faded figure for a dotted-outline figure. The reason to have the solid ("real") figure in the distance is that Teleport works by going from near to far. If the close-in icon is solid, you get "Recall Friend." Just make the arrows horizontal? Or wrap the "From" figure in a shape with an arrowhead pointing at the "To" figure. P.S. Would love to see some of those examples your friend provided. I think ThunderCAP is on the right track with his idea of conveying a TP like image. +1 from me too, but I would make the behind stance look slightly different, maybe it should have the line effect rather than just making the figure grey. Like this at the back but with the same stance. I think you missed the 2nd version which is not "just gray" (there is a "light/explosion" effect in the middle, like the particles that are imploding), and imho it's better than the "striped look" (which may seem "invisibility"). Just saying having this shrunken down with the solid figure in the background won't come off as well with the faded figure taking up most of the space in the foreground. That it would probably be easier for most people to make out that way. With the right graphics tools (which I don't have, obviously), this would be trivial to DO and demonstrate. Simply clip the image I provided and shrink it down to "actual" size. Judge on merit, not hearsay. TEST IT. Would take all of, what ... 3 minutes with proper tools? I've actually shown this to someone who has had over 20 years experience in commercial graphics design and he concurred. He even provided me with some examples from other games concept art that did something very similar and the sold figure was always in the foreground. And I'm honestly surprised, Tannim. How many more disclaimers do I need to put on what is essentially a Concept Demonstration using representative, rather than Final, symbology? I kept trying ... repeatedly ... to explain a relationship between two figures that amounted to use of One-point Perspective, and it kept sailing over everyone's heads. EVERY. SINGLE. TIME. Indeed, I had to come along with the proverbial tire iron (and no, the irony does not escape me) and beat people over the head with it to convey the concept AT ALL that One-point Perspective should even be considered a "valuable" method of conveying information easily/quickly/reliably in this context. And now you want to argue about which color goes where. Look, I'm not "wedded" to the notion of which one has to be fading out and which one has to be solid. I have a preference for the arrangement shown because to me it reads (from left to right) as "Leave HERE. Go THERE." That's it. WHICH figure gets the "fade" treatment (or "horizontal transporter lines" through it), for me, comes down to asking which "way" makes the icon at final size/rendering easier to read. My thought is that the smaller figure is easier to read/discern if it's solid, while the same is not AS true for the larger figure inside the frame ... hence my decision to fade the big and solid the small. But then, what do *I* know about these things, eh? I'm coming into this kind of late. Apologies for that. I'm a professional graphic designer myself, specifically in the signage industry. You seem to be reacting to everyone else's input, so I thought I'd throw in tuppence for a lark. If these examples are really super-preliminary then I apologize for that, too and feel free to disregard my input. The problem I see is... let's call it "stylistic inconsistency." Where you portray a human figure in most icons they are fairly realistic silhouettes. The wall crawling has an "International symbol" generic quality. Likewise with the Teleport. They should all be one or the other. Also, since you are removing one animal icon (spider) the Flight icaon makes less sense as the only animal rather than another human figure. That leads to the Grapnel icon, which now becomes the only icon that is NOT a human figure. 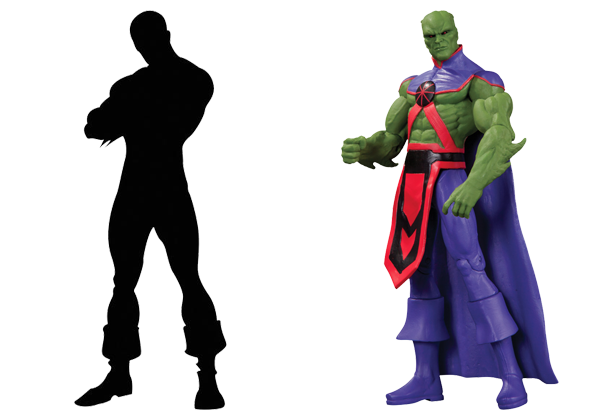 Nor is it a simple silhouette like all the others...um, except for Teleport. Believe me, I sympathize with the difficulty of portraying all these things intuitively and simply. I'm not trying to pick a bunch of nits, or insult you by talking to you like you don't understand what I'm saying. I'm hoping that the constructive criticism offered by me and others will help to make this game look more polished and professional. And again, please refer to my first enjoinment to ignore my input if this is all just preliminary top-of-the-head place holders. Red, I think most people here understand "One-point Perspective". You may just be receiving the same level of critique that you dish out. 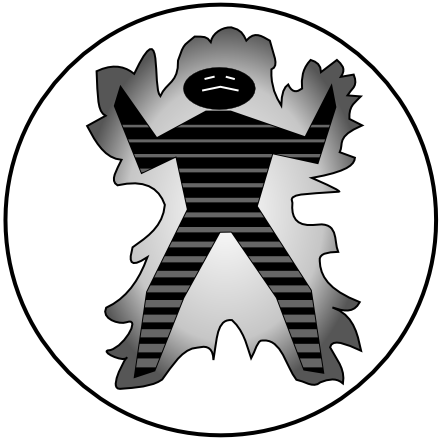 Well when I look at your proposed icon outside of context I can't tell if it's a "Giant shadow that will crush you power" or a "shrinking power" or what. I don't know that any level of refinement would help. The bottom line is that for it to be completely intuitive, too much information has to conveyed in too little space. I think with a little refinement Interdictor's or Lin Chiao Feng's icons would work just fine. All input is appreciated and I do agree with your points, icons shouldn't be inconsistent. I still think that changing from icons to words is the way to go but seeing as you work in the signage industry I would love to see your interpretation of the teleportation icon. Please don't feel that you have to it is only a suggestion. after some more Googling... i see why some people were concerned that the Silhouette of a Person shouldn't be Ridgid, on Left, and be more like the one on the Right, depicting motion. The bottom line is that for it to be completely intuitive, too much information has to conveyed in too little space. Agreed. You practically need an animated GIF in order to "properly" convey the entire image of "disappear from HERE and reappear OVER THERE" effectively without alternative interpretations. The icons should all have the same theme ie humans conveying movement based on said travel powers. Or, each power could be represented by an item that represents the power. The idea is consistency as the graphic designer put it. That being said, why did this become a debate? Did I miss the part where they asked for help? Lol - don't know - but that never gets in the way of a good discussion. But in any case - I'm sure whatever the Devs go with re: teleport or any other power icon - once we see the pic and read the power's description - it'll click - just like it did in CoH. We will "learn the language" with time. Good points, and I've been thinking much the same. Icons merely need to be symbolic, they don't need to be explain all the details of what something does. An icon for teleportation could simply have a Tau on it and anyone who Used it would recognize what it did, afterwards. Therefore, there was not a single thing wrong with the original icon. It was unique and recognizable. So, it didn't need changing. I think the original complaint was about the Spider, for wall-climbing, which was quite effectively replaced by the disco-dude. "Was gonna TP, but caught on Fire! Again!! and maybe wet myself! Again!!!!" 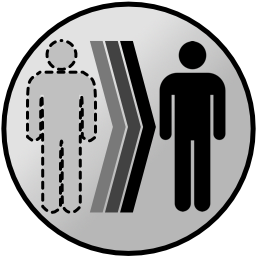 teleport icon. Except its a TP Others, which doesnt actually TP others, just Stuns them, and sets them on Fire! Where's the fun in that? It could be a custom animation for Super Jump: a little remote control, hovering prod appears behind you and--YALP! you clutch your bottom and are propelled across town. Then you land and repeat. +1 From me I like it too. My only extremely minor quibble with this is that the light gray "arrow" should be closer to the dotted-line figure and the solid black "arrow" should be next to the solid figure. The reasoning is that to me the light gray going towards the black implies traveling from the incorporeal "mid-transport" phase to the solid post-transport phase. To make the lines more overall "arrow-like" the lighter gray ones could be shorter/thinner than the darker solid black one to better imply the motion/rematerialization concept. I'm liking this one so far. 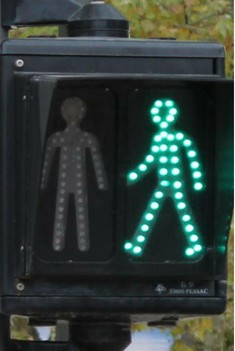 Maybe just add some arrows on the right hand side? I've been quite busy with other stuff and haven't had a chance to look at this thread these past few day. One of our team just let me know this topic has been quite active still and I'm impressed with just what I see skimming the postings (I'm really deep into some code and don't have much time at the moment to give any in depth attention, but I hope to be able to soon). Just because nothing has been marked as official here yet doesn't mean that it won't be, or at least some incarnation of it. That's why the communities input is so vital and why we share our ideas and our progress. Your remarks help with those decisions and your ideas do lead to internal discussion and definite consideration. This company started out as a community project and we haven't forgotten our roots. Again, my "door" is open. Go ahead and drop me a personal note at any time. I may not be able to respond to everyone immediately, but I'll still make an effort to look. (I'm really deep into some code and don't have much time at the moment to give any in depth attention, but I hope to be able to soon). So what's the program you're using for these icons? Redlynne, you're awesome as usual. 1) Thank you for taking that as a constructive criticism. 2) I was thinking about GIFs too. I didn't mention it as I was short on time and had some concerns about the idea. For instance I suspect that having GIF icons could make it harder to find the button and also be a bit distracting. It might make for a very busy screen. Of course it may work better for some than others. It might be nice if the UI allowed players to make/choose their own icons. I suppose we could call that "button decoupling". Is their another update coming soon? how do i upload a pic directly to the forum post? Not ignoring the thickness change idea, just don't feel like doing that at the moment. I'd have to work out a function for thickness vs. chevron index before I'd be happy with it. Also I'd probably remove the gaps between the steps and make it 4- or 5-step. Pixelmator has everything I used in Photoshop and it's just $30 on the Mac App Store. Sure, the controls are in different places, but that's just like every bloody Photoshop release, too. Also, like Izzy, I use Inkscape as well. It's a little wacky on Mac because it requires Xquartz and has its own UI standards, but it's workable. Main reason I use it is because I'm trying to cook up a custom keyboard and WASD Keyboards prefers SVG and provides an Inkscape template with instructions. TL;DR: Pixelmator for raster images (i.e. Photoshop replacement, though it supports vector objects too) and Inkscape for vector images (i.e. Illustrator replacement). Redlynne, you're awesome as usual. 1) Thank you for taking that as a constructive criticism. That's the default assumption, barring obvious evidence to the contrary. 2) I was thinking about GIFs too. Kind of the only way to "square the circle" on that one, really. For instance I suspect that having GIF icons could make it harder to find the button and also be a bit distracting. Agreed. Animated GIFs would be more trouble than they're worth, effectively ruling them out as a practical option. The unfortunate thing is that for the information we want to convey, they would be the most intuitive ... but from a UI Design perspective they would be the most disruptive. Another reason to avoid animated buttons is that they get distracting fast, and not everyone can sort through that much visual noise. I don't think you can, except for your avatar. I think others may be using DeviantArt. and it will generate the Forum Code you can Copy and Paste into a post. Red and I have been using imgur.com. Also make sure it is a JPEG. Also make sure it is a JPEG. When I was uploading all the original stuff as PNG's and people were having trouble seeing the images. I guess PNG images have issues on forums. Only if the forum tries to do something with them, which I guess is the case here. If the forum would just display it then any issue would be a browser one, which should not be a problem today. It seems as if you put the jpgs on tinypic and the pngs on Google. Google is doing something evil with cookies or browser strings or something to decide whether we deserve to see the images or not, instead of just displaying them as requested. We have not officially moved any dates from the last time it was officially communicated. Shard is not on the PR team, and it would be a PR team member that would make official notice of us moving a date. I hold no relevant positions, whatsoever.